Swan Village opened on the then GWR's Birmingham to Wolverhampton line on th 14th November 1854 some two months later than planned due to the collapse of one of its bridges in Winson Green and Brunel's subsequent order for strengthening of several other bridges on the line. Interestingly, the line was mixed broad gauge and standard gauge upon opening. As can be seen above (photo: Michael Mensing) from 1957, the station buildings were wooden originally although they were replaced a year after this photo was teken by a brick built structure. Although not discernible in this image, off to the left of the shot was another branch which came off the main line just behind the photographer and extended to Great Bridge South thus allowing entry to the lines to Dudley. 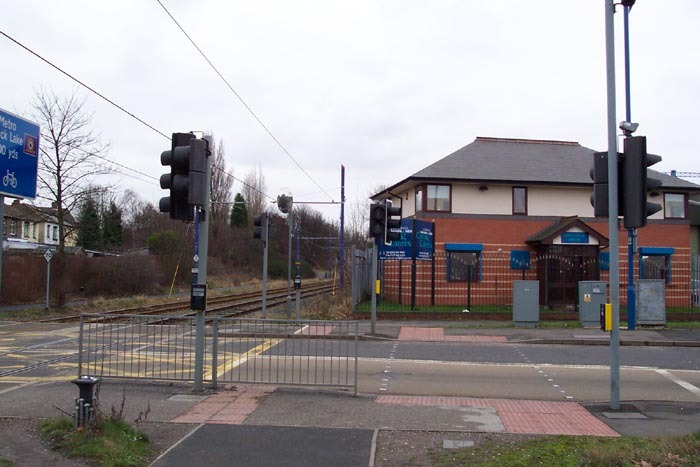 Hence, the station building to the left also served the Dudley branch. 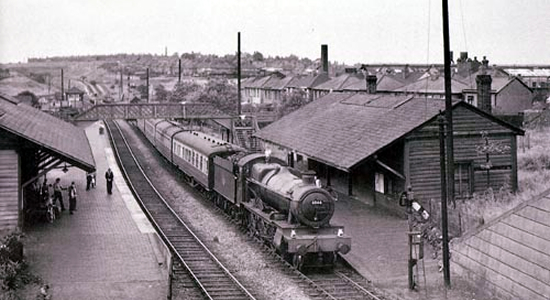 The Wolverhampton line closed in 1972 with the Dudley line withering away in the 1960s. 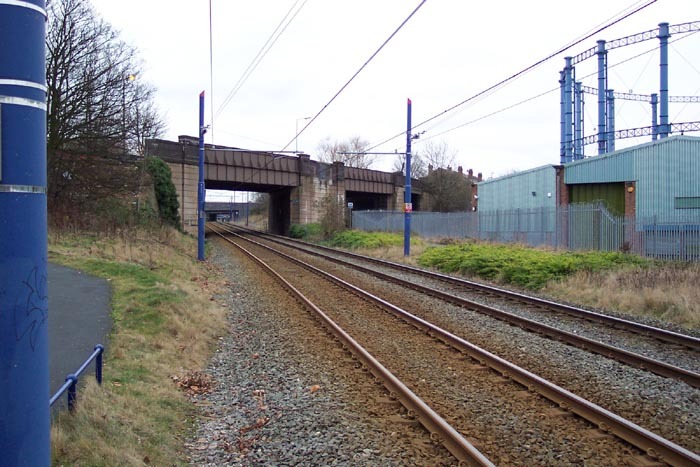 However, the Wolverhampton line was relaid and opened in 1999 as the route for the Midland Metro light railway (tram) from Birmingham Snow Hill to Wolverhamtpon St Georges but unfortunately this didn't indicate the reopening of Swan Village station but merely the complete clearance of the site. Above-left we are looking in almost the same direction as Michael Mensing in 1957. 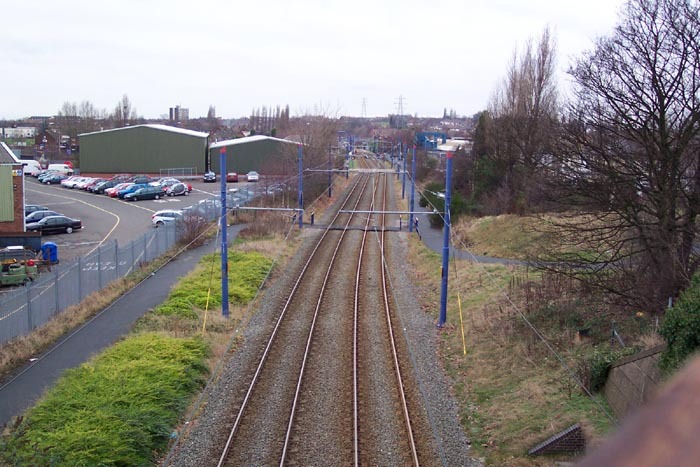 We are standing on the Bilhay Lane overbridge looking towards Wolverhampton and, as can be seen, nothing remains of the station with the site of both buildings being replaced by an industrial unit and car park to the left and grassland to the right. Aboiver-right we are standing roughly where the first coach behind the engine is located in Micahel Mensing's photograph and looking back at Bilhay Lane overbridge. To the right of the bridge span over the now-Metro lines you can see the span which carried Bilhay Lane over the Dudley Branch. Above-left we are roughly at the base of the footbridge on the Wolverhampton platform in Michael Mensing's photograph looking towards Wolverhampton with the Swan Lane level crossing ahead: the level crossing can just be discerned in the photograph at the top of this page by the signal box controlling the crossing which is just beyond the footbridge and, sadly, no longer in existence. 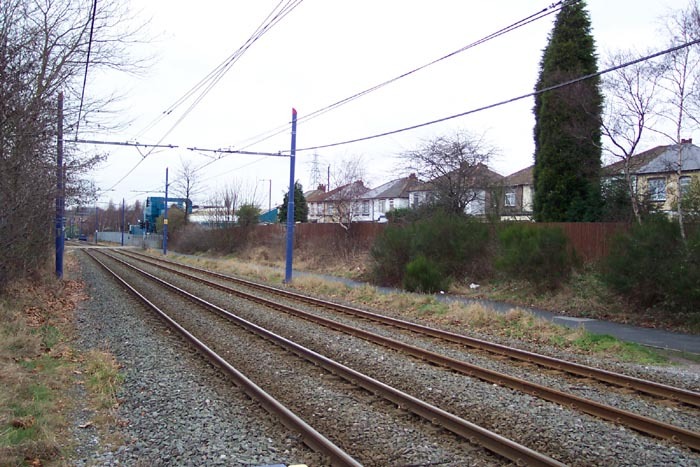 Above-right we are at the Swan Lane level crossing looking back at the station site with what is now Black Lake Metro stop immediately behind us. The signal box would have been straight ahead of us and we can see a new office building standing on the site of the Wolverhampton platform. It is worth a visit to the site as there are lots of remnants around and, of course, there's also the Black Lake Metro stop to see too which is the other side of the Swan Lane level crossing from the old station site.